It’s come to my attention that I’ve been a bit remiss when it comes to Fancy Fridays. Apologies. Maybe it will be Fancy every-so-often Fridays. Anyways, I’m here with a recipe for seared ahi tuna with wasabi vinaigrette. With a properly heated pan, good-quality tuna and the correct ingredients for the vinaigrette, this recipe is so easy it’s not even fair. Fun fact I learned while preparing this – contrary to popular belief, searing the fish does not “lock in flavor” but rather creates a flavorful and attractive crust. I’ll take it! The dish is presented here with wasabi mashed potatoes, which I hope to share in a future Chef Juje post. I like my dinners precariously perched on the counter. 1.) layer salt and pepper on the cutting board. Seriously pile the salt and pepper on thick. 3.) Press the tuna onto the cutting board so that all sides are covered in pepper and salt. 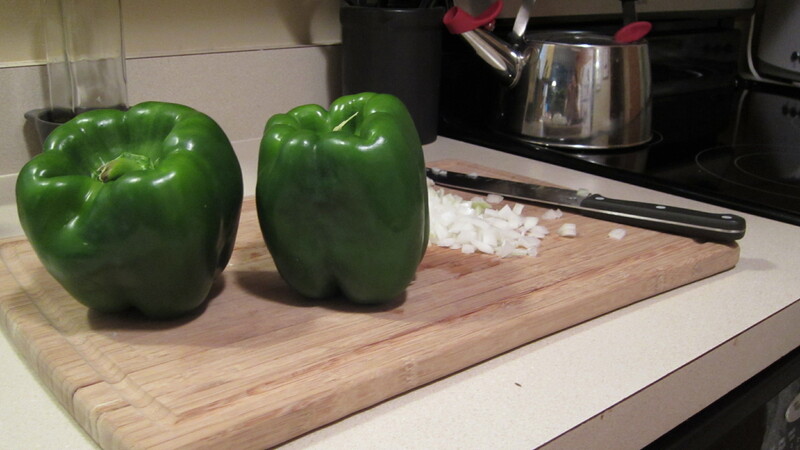 Seriously, pepper the heck out of this thing. 4.) preheat the pan to medium-high heat. I used it just a touch over medium. Sear each side, including edges, just until the golden crust forms. 5.) After all sides are properly seared and browned, place on a cooling rack. Serve with the wasabi vinaigrette, pickled ginger and wasabi mashed potatoes (recipe coming soon). Things I learned/Helpful Hints/Question for Readers: I was a little afraid to cook the tuna any more rare than this because only flash-frozen tuna was available. Does anyone know if such tuna can be cooked rare? The salt actually extracts water from the fish, so pat the fish steaks dry before putting them in the pan. Otherwise the fish might steam and not sear properly. I didn’t cut the ahi into smaller pieces, though for more fancy presentation that might be a good idea! Years ago I worked as a server at a casual restaurant in my hometown. I was (then) a horrible, horrible server. Glasses were left empty and orders were forgotten and – this is a major confession! — I never asked any table if they wanted to order cookies. Never. If people wanted cookies they would ask for cookies! Plus the cookies were really annoying to remember and I would always forget to ring them in or I’d let them burn and really doesn’t everyone already have enough cookies? The cookies were a tremendous source of stress. While I was there, though, the restaurant introduced a new seasonal menu item – Tomato Mozzarella Chicken Sandwich. Now, I have no idea how they made their sandwiches. Occasionally I had to prepare one but my memory of it is fuzzy. However, I have eaten a number of those sandwiches. They’re truly scrumptious. I recently re-created the sandwich at home. I’m sure that with a grill pan for the chicken or a panini press for the sandwich, this would be even better. But for now it’s just my pan and me and we do what we do. 1.) Toast ciabatta bread for a few minutes, depending on thickness. Watch it closely – this sandwich is less delicious on a giant ciabatta cracker. 2.) Spread one or both sides with the basil pesto. 3.) Layer basil, sundried tomatoes, chicken, and mozzarella. 4.) Cut in half, grab some extra napkins and enjoy. I was fairly successful at pan-frying the chicken. 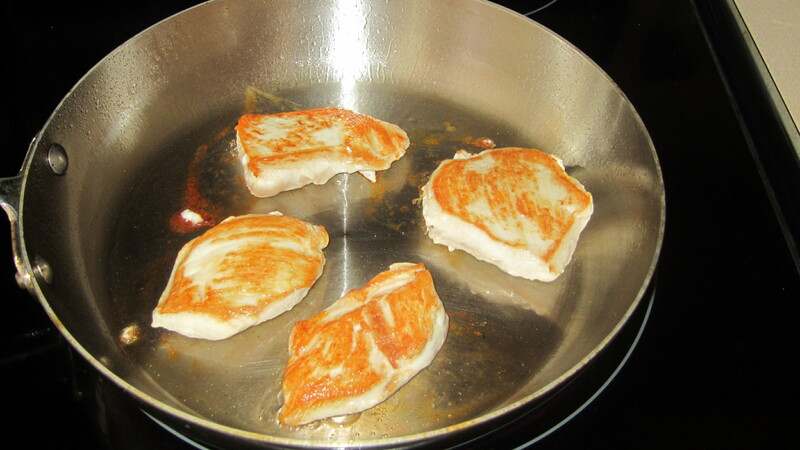 The purpose of pan frying is to form a golden crust. Make sure the pan is hot enough before you put your oil and ingredients in, though I’ve heard with a nonstick pan you should put the oil in as the pan heats. Finally, there’s probably too much space between the chicken in this particular picture but, again, I’m working with a lone pan. The fiance and I both love Giada DeLaurentiis. I used to think it was for very different reasons. I like the ingredients she uses and the clarity with which she explains each of her steps and, fine, because her show is on late enough in the day that I can occasionally catch it if I get home early. As for my fiance…well…it’s an easy cooking show to watch. I was impressed. This means that he actually watched the show. With the sound on. And listened. So I found the recipe for her Bucatini All’Amatriciana with Spicy Smoked Mozzarella Meatballs and got to work. Next time, I will do the sauce a little differently by using twice the tomatoes as called for in the recipe and less or no pasta. My ratio was just a little off or the sauce over-reduced. But the MEATBALLS. Oh my gosh the MEATBALLS. And so, I present just the meatballs here. The recipe actually doesn’t call for searing the meatballs first, though I might try that next time. 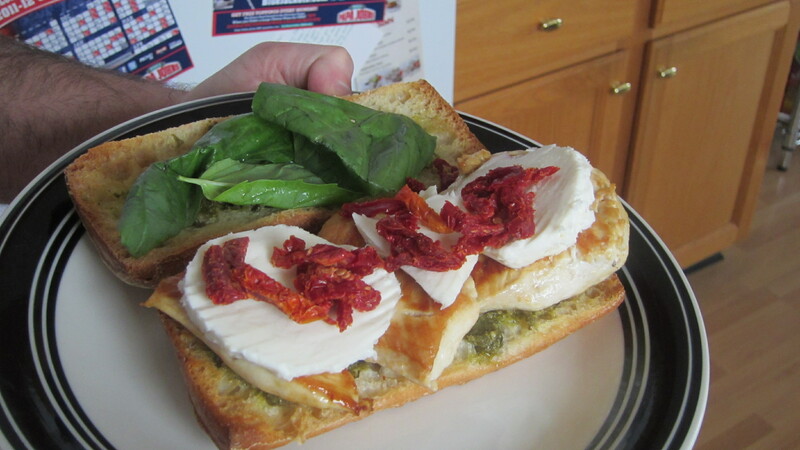 I also used regular mozzarella and not smoked — still fantastic. 1.) Place oven rack in lower third of the oven and preheat oven to 400 degrees. Line baking sheet with parchment paper. 2.) In LARGE (seriously) bowl, combine the onion, parsley, Parmesan, bread crumbs, egg, ketchup, garlic, red pepper flakes, salt and pepper. Then add the beef and veal, or the meatball mixture if you find it. 3.) Use your hands to combine all ingredients. Be gentle but firm. Make 16 meatballs, each about 1.5 inches diameter. 4.) Make a hole in the center of each meatball and place a cube of mozzarella inside. It will kind of look like you’re planting mozzarella. Genius. 5.) Reform the meatball so that the mozzarella is completely covered with the meat mixture. 6.) Bake the meatballs for 15 minutes until cooked through. Grated is not minced and is certainly NOT diced. This very much matters for meatballs. Onions for the meatballs need to be very, very finely chopped or else they won’t form into balls well. Searing the meatballs first in a pan can help create a nice crust on the meatballs. They will still need to be cooked in the oven. I’ll try searing first next time. I found a ground beef/veal mixture at the grocery store that worked really well for this. Always listen to your loved ones when it comes to what’s delicious. He was totally right with this. Last week I found myself leftover good-quality Swiss cheese from both a successful attempt at cheese twists and a completely failed attempt at butternut squash soup. I find myself in this predicament quite frequently as a newbie chef. I’m constantly torn by the desire to reduce waste and save cash AND the desire to create deliciousness. I am sure that one day those goals will not be at odds with each other and that I’ll be able to whip up meals using exactly what I have in my pantry and fridge. Until then, though, I find myself searching “recipes that use Swiss cheese” only to find hundreds of recipes that require a zillion additional ingredients I don’t have or equipment I don’t own. 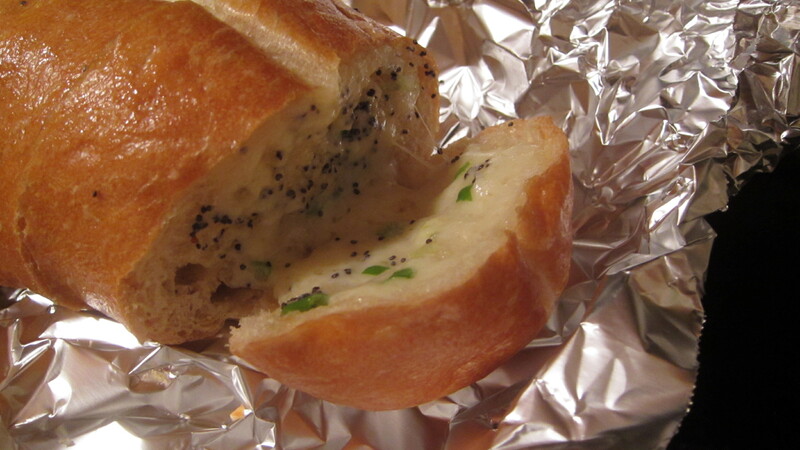 Finally I stumbled on this recipe for Swiss Cheese and poppy seed bread from Rouxbe. Fresh French bread and a compound butter make this an easy and unusual treat. The recipe below features much less butter than the original recipe and real Swiss cheese, but feel free to try it their way and compare! 1.) Pre-heat oven to 375 degrees F. 3.) Slice the french bread into 1 inch slices. Don’t cut all the way through- leave the bottom in tact. 4.) Slice cheese into triangles or small squares. It should fit inside of the slices of bread. 5.) Spread the butter mixture in between each of the slices. In this recipe, use the butter liberally to ensure rich flavor. If you follow the original recipe, you may have extra butter left over. 6.) 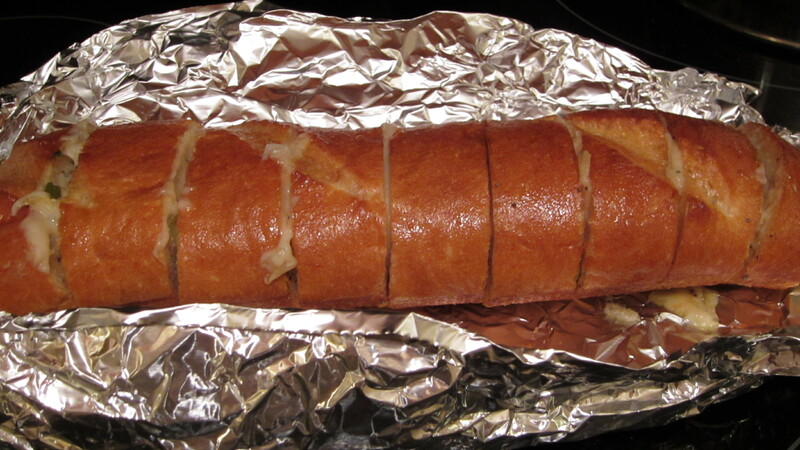 Wrap the loaf tightly in foil. Bake for 20-25 minutes or until cheese melts. Serve. Compound butter – Compound butter is basically butter that’s mixed with other ingredients (in this case, mustard powder and poppy seeds) to enhance flavor of a dish. I look forward to trying out a compound butter with garlic or other spices. Serve and eat immediately – This was very unsuccessful re-heated in the microwave. Perhaps re-baking would have been better. Ideally, though, eat it right away. 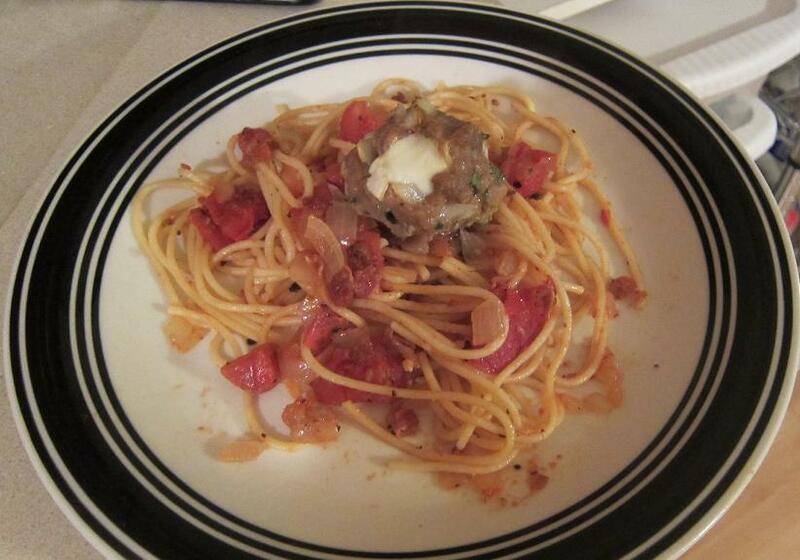 Editor’s note: This recipe is brought to you by Chef Aud, my sister and aspiring home cook. I love the addition of horseradish to this dish! The final product. Bon app! So, the AFC championship games are on tonight… or whatever they’re called. Not terribly invested in any of the teams, but tonight afforded me the opportunity to prepare game day nosh. 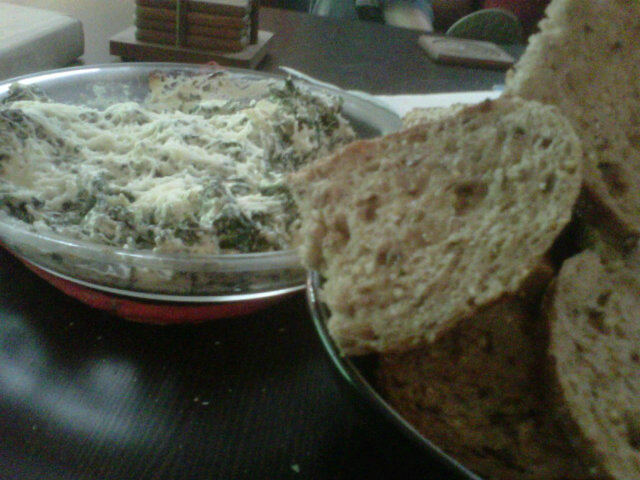 I’ve made variations of spinach dip through the years. Rarely can you mess this one up. When enough cheese is added, it becomes foolproof. Here’s my take on the goods. Preheat oven to 350. Thaw the spinach. I microwaved it. Remove all of the excess water. There will be a lot of water. You’ll be surprised how much water escapes. Drain all of it. Meanwhile, sauté the onions until browned. Combine the onions with the drained, chopped artichokes. Add the mixture and garlic to the spinach. Slowly fold in the cream cheese and butter. Add the horseradish, salt and pepper. Mix thoroughly. Spread the mixture in a pie dish and top with parmesan cheese. Bake for 10 minutes. Serve with toasted whole wheat bread or chips. Enjoy the game! So it’s been a few days since I’ve last posted, largely because of an absence of success in the kitchen. For one, I spent Saturday night (aka the only single-digit-temperature night so far this year) camping and although our campfire hot dogs were delicious at the time, they’re not exactly blog-worthy. Second, I spent about three hours and twenty bucks on a butternut squash soup only to discover that I actually don’t care much for butternut squash after all. Hrmph. But today, Chef Juje is back! And armed with a camera! Get excited. 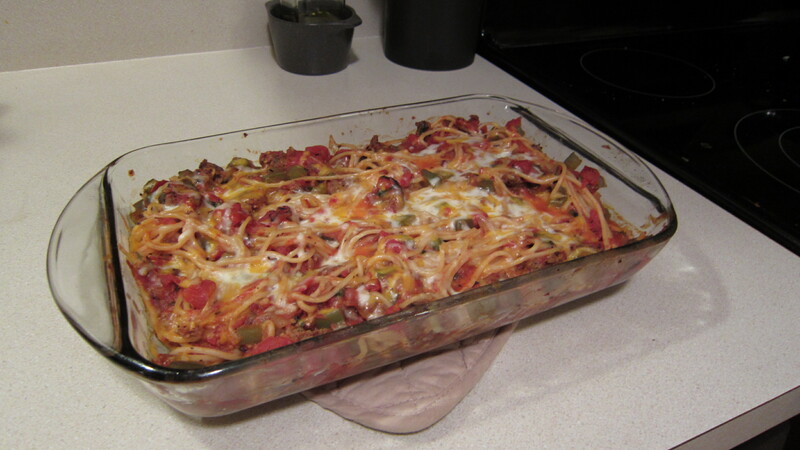 I eyed this baked spaghetti recipe in, where else, my latest food network magazine. I’m usually wary of dishes from Paula Deen (sorry, I just don’t like butter THAT much) or recipes that purport to be light but are full of fake foods. Fat free cream cheese? Ugh, why bother? This recipe, though, is from Paula Deen’s son and to my surprise uses REAL ingredients. I give a pass to part-skim mozzarella. For you big-picture-people out there, you basically place a layer of spaghetti, peppers and tomatoes in a glass dish, layer with mozzarella and cheddar cheese, repeat, and bake. 1.) Add salt to a large pot of water and bring to boil. When it starts to boil, put angel hair pasta in and cook as package instructs. 2.) As water is brought to a boil, heat a large skillet. 4.) bring everything to a boil, then reduce to a simmer. (BTB, RTS) Let cook until sauce thickens. 5.) Add spaghetti to the skillet and mix everything well. 6.) Spray 2-quart casserole dish with cooking spray. Add half the pasta/sauce mixture. Layer with half each of the cheeses. Add the remaining pasta/sauce mixture, then layer with the rest of each of the cheeses. 7.) Cover loosely with foil. Don’t let the foil touch the cheese or messiness will happen. Cook for 20-25 minutes. Let rest a few minutes before serving (or tasting!). Salt is added to pasta water to bring out the flavor of the pasta. Pasta absorbs water as it cooks and will absorb salt, too, which is why you can’t just add salt afterwards and have the same effect. Welcome to Fancy Fridays! Today’s recipe is easy enough but is delicious enough to be passed off as fancy. I’ve become a little obsessed with Rouxbe, an online cooking school I’ve found. It’s through Rouxbe that I came across this fantastic stir-fry recipe. The recipe itself called for broccoli, which is not a favorite in our house, so I used red and green peppers, snow peas and celery instead. Truly, you can use whatever veggies you find delicious, just be sure that crispier vegetables are cooked first. 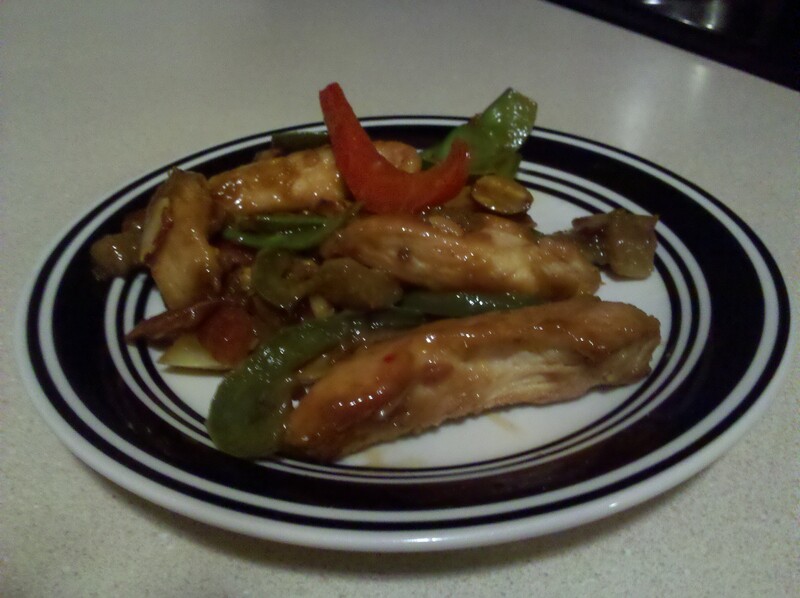 The recipe is really “just” a stir fry — stir fry the chicken, stir fry the vegetables, stir fry everything together. The difference here is that you will “velvet” the chicken to give it a smooth, velvety texture. You then use a couple of clutch special ingredients (oyster sauce, red chili paste, sherry) to mix with the vegetables to give it that maybe-I-secretly-ordered-Chinese-take-out kind of flavor. That’s really it. I struggled a lot with the actual stir-frying of the chicken because of my impatience with my baby stainless-steel pan, but that only has to do with my being a novice in the kitchen. The hardest part is forking (heh) over a little cash up front for the special ingredients. Once you do that, though, the dish becomes pretty inexpensive. 1.) “Velvet” the chicken – Place bite-sized pieces of chicken in medium bowl. Mix the cornstarch, soy sauce, sherry and oil in small bowl. Pour over the chicken and stir to evenly coat. Set it aside, while you make the sauce. 2.) Make the sauce – Combine the chili paste/sambal, oyster sauce, soy sauce and sherry in a small bowl. 3.) Infuse oil with ginger and garlic – Heat pan/wok. Once hot, add oil and then ginger and garlic. Remove ginger and garlic after a few seconds. 4.) Stir fry the chicken. You will generally need to do two batches of chicken, as you don’t want to overcrowd the pan. Separate pieces that are stuck together and let sit for a bit before tossing. Cook until golden and just done. 5.) Stir fry veggies – put veggies in the pan/wok and cook. Cooking time depends on the type of veggies you choose. Carrots = longer. Add the sauce from step 2, then cook until vegetables are done. Add chicken and almonds. Finally, add the green onion and toss. Cook until everything is heated through. Helpful Hints: A properly heated pan or wok is essential for this and is something that I’m still working on! I use a stainless steel skillet for now (we have an electric range and woks are designed for gas ranges), so my temperature is going to be a little lower. I’ve heard chef pans work well, too, for electric stove tops. Also, let the chicken sit a bit in the wok/pan before tossing. The chicken needs time to develop a crust. What’s the first thing you do when you want to start running? Buy new running shoes! What’s the first thing when you want to start cooking? Buy new pots and pans! So a few weeks ago when I started this project, that’s exactly what I did. I ran to Macy’s and bought a new All-Clad stainless steel skillet. It was BEAUTIFUL. All sparkly and heavy-but-not-too-heavy and it heated up Just Right. I have a special place for it on our baker’s rack separate from the other, far inferior pots and pans I’ve collected. The thing is, since it’s my only really high-quality pan I end up using it a lot. A LOT. And as much as I try to give it the TLC it deserves, I started slacking. I washed it regularly but started to see some oil deposits and rings from the dishwasher. The skillet started to look less sparkly and started heating up Too Much or Too Little. Sure, the pan looked all right, but this is not just an all right pan! It deserves more. After soliciting the advice of the internet, I ended up using this product called Barkeepers Friend. I found it at in the cleaning aisle of our grocery store, near the oven cleaners. Fun name and even better results! 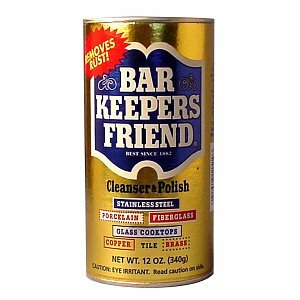 I wet the pan a bit (not too much, as having excess water actually detracted from the cleaning process) and lightly dusted the less-than-perfect areas with this barkeepers friend product. It looks a bit like Comet in the fact that it’s powdery and creates a kind of scrubby paste. Anyways, I then used a wet rag and scrubbed and scrubbed and scrubbed. (Sidenote: I’m pretty sure a washcloth of sorts would work even better than the dishtowel I used. But even mine worked well). Rinse completely and voila! A very strong right bicep and a perfectly sparkly pan. I’m testing it tonight and you’ll learn the cooking results in my next post. I take new year’s resolutions very seriously – especially when they’re fun and really only benefit me. Ha! This year I “resolved” to go on one adventure each week that I’ve never done before here in Columbus, like visit all the metro parks, see Rocky Horror Picture Show at Studio 35 and try Somali food. This week I visited the Clintonville Winter Farmer’s Market. Maybe it’s the old beautiful houses or the Olentangy trail or the general strange-but-wonderful-ness of the area, but I simply LOVE Clintonville. It’s January and Ohio so there wasn’t a ton of produce available, but I did leave with a giant loaf of ciabatta bread, a basket of red potatoes and two giant sweet potatoes. I’ve eaten a lot of sweet potato fries as of late so I tried this new dish from an old cookbook. You basically take a bunch of 6-inch tortillas, spread a black bean mixture on the bottom of each, then add a layer of sweet potato puree and finish with some shredded Monterrey Jack. This is the follow-the-recipe-exactly-because-I’m-still-learning variety, but I’ve come up with some ways I’d like to spice it up in the future. Maybe additional spices (paprika? red pepper flakes?) for the sweet potatoes or black beans. 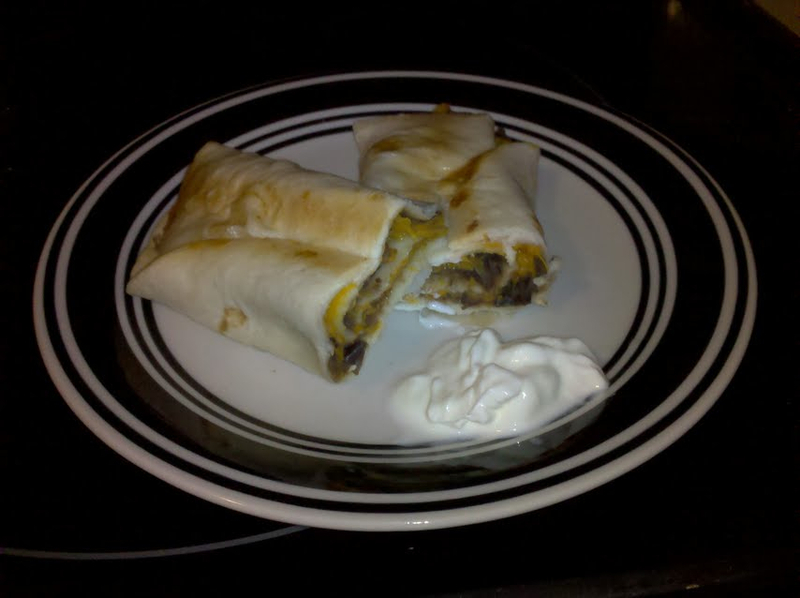 I might also roll the burritos Chipotle-style, or cut them into smaller pieces and serve as an appetizer. Ideas welcome! Oh! One last thing. I think you can microwave the sweet potatoes instead of baking them in the oven. But see previous posts about how I like to make things as complicated as possible. Meanwhile, heat 2 tablespoons vegetable oil in a large skillet over medium heat. Add the onion and cook, stirring often, until softened, about 5 minutes. Add the garlic and cook for 1 minute longer. Stir in the cumin and chili powder and cook for 1 minute. Add the beans and vegetable stock, cover, and cook until the beans are very soft and the flavors have blended, about 5 minutes. Use a fork to coarsely mash the beans. Season with salt and pepper. You should have about 1 1/2 cups. Spread the tortillas with roughly equal amounts of the bean mixture. Top with equal amounts of the potato puree. Sprinkle on equal amounts of scallions and cheese. Roll the tortillas into cylinders and arrange, seam side down, in a baking pan large enough to hold the burritos in one layer. For a soft burrito, cover with foil and bake until warmed through, about 20 minutes. Bake uncovered for a crisper burrito. Arrange the garnishes attractively in bowls and let diners garnish their own burritos. Helpful Hint: Save some counter space for the arrangement of the tortillas.